A Christmas Carol has become such a classic of the holiday that it's practically a part of Christmas tradition for some families. If you think of a Christmas book, this one will definitely pop up. Surprisingly this is my first year actually reading it, although of course I'd seen an animated version. There are SO many animated versions, and plays, and... clearly the story is popular. It's hard to rate a plot I already know so well, but it was an inventive and predictable one. The ghost of Christmas past is more jolly, the ghost of the present has an ominous ending (and those children are creepy) and it makes sense the third, filled with doom, would be silent. 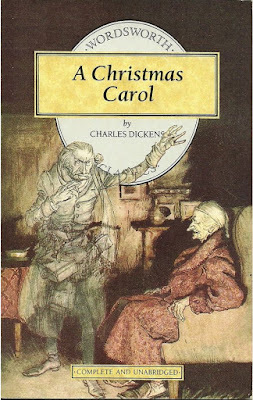 Dickens did a good job fleshing out the characters in what was supposed to be a moral tale. 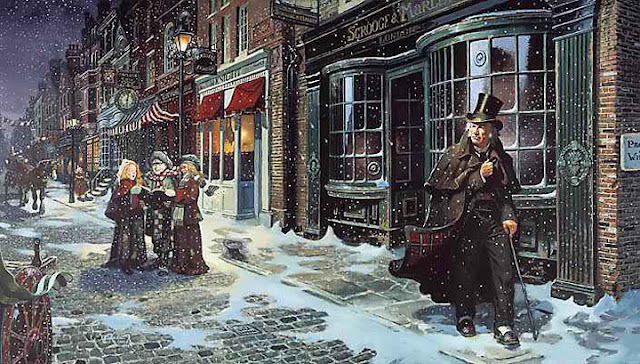 Most were there as archetypes to loan the moral lesson cred, even to the point of Tiny Tim who is supposed to be seen as so sweet and helpful his name starts with 'tiny', but despite this not many can say they haven't heard of Ebenezer Scrooge. He was not only a fully fleshed out character, but he became one of the most popular characters in literature, theater and film. A wonderful book that showcases moral lessons that are suitable for the entire year, but especially at Christmas, especially when you want to turn that frown upside down and get rid of the 'humbug' mentality. Bring on the Christmas cheer!